As part of the development of the Business Analysis technique, we looked at how it could become a more interactive process. The solution was to display the information as it was captured by the Business Analyst. It achieved a number of things. "You will have seen from your records that I bought a copy of your "Method H" software recently. I used it on an assignment to help analyse the high level system landscape of a bank and very well it worked too! Effectively cut 3 days out of the 10 day project, giving me more time to do "value-add"." In the spirit of keeping the business analysis software simple, we have chosen to develop an application using Microsoft Access (.mde file). The application includes a main screen where the Business Analyst adds data. The screen also includes some pop up screens to update project information, and to create notes regarding the interview. You do not need Microsoft Access installed. The installation program will install a runtime version if you do not have Access on your computer. The key is that the information can be projected onto a screen by the BA and form the basis for collecting data. Information is logged by the Business Analyst as they go. The same information is also available in a tab format screen. This is easier to use with experienced business users. It is also easy for a Business Analyst to review and sort the information. There are three reporting menus. 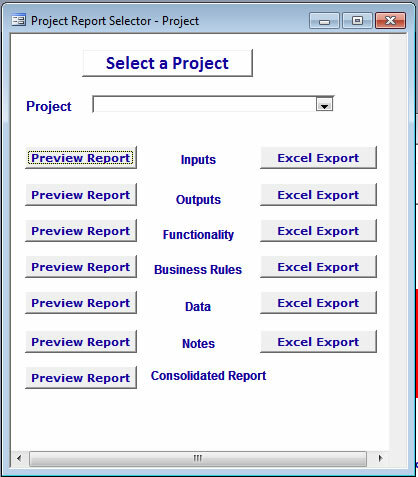 The screen to the right is used to select all of a category for a project. For example, it will print out all the Inputs recorded across all interviews for that project. There is also a consolidated report which lists every category (Inputs, Outputs, Functionality, Business Rules, Data and Notes). The other set of reports requires selection of both a project, and an interview, or a project and a business process. The reports can also be downloaded into Microsoft Excel for further manipulation by the BA. Sure, you could produce an Access program yourself, but what is your time worth? How long would it take, and how much does that work out per hour? This program has been tested, and refined to fill your requirements. It works first time. The product is available in two versions. One uses Access 32 bit, the other Access 64 bit. 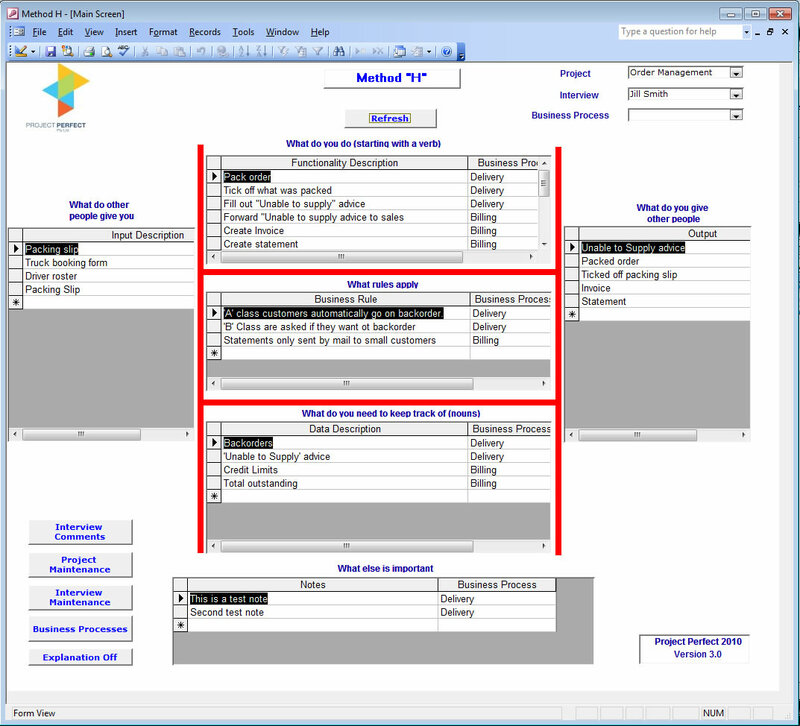 "I just completed a 2-day process analysis with a client, using 'Method H'. Everyone agreed that this was a very effective way to capture and record their critical business processes, and the whole group really enjoyed using the structured approach your software provides. I intend to make 'Method H' my company's standard model for all future process analysis consultations with our clients."